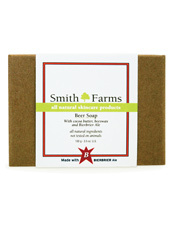 Description: Smith Farms Beer Soap combines rich shea and cocoa butters with olive and castor oils to create this moisturizing and cleansing bar. The distinctive ingredient is Bierbrier Ale, a beer made in one of Montreal’s boutique breweries, which boosts the soap’s lather and gives the product its signature scent. The soap is non-irritating and is suited for sensitive and dry skin.